Some girls dream of being the hero. They want to swoop in at the nick of time, smack the villain in the face, save the good citizens of Gotham City and gain the praise of Commissioner Gordon. They want to lead the Justice League and give Wonder Woman a high five. Other girls? Well, they just want to watch the world burn! Perhaps that’s the kind of girl you are. Maybe you don’t want to play hero, but maybe you want to be known as a troublesome agent of chaos! If that’s the case, then it’s time that you stepped into the role of The Joker. As The Joker, you get to become Batman’s greatest foe and the bane of Gotham City. No one will be able to predict your next move and maybe, that’s just the way you like it. Of course, the first thing you’re going to need to kick-start your new villainous attitude is a costume to match! 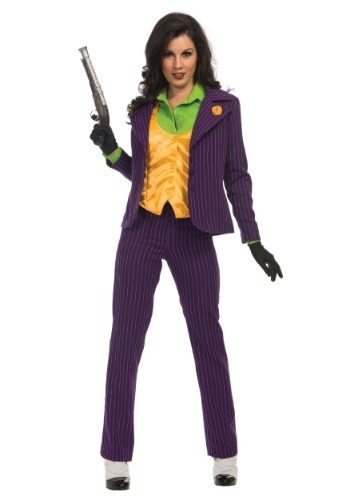 That’s where this women’s premium Joker costume comes into play. This women’s Joker costume fully recreates the Batman villain’s outfit in a style suited for any female villain looking to run amok in Gotham City. The costume comes with a purple pinstripe jacket with a matching pair of pants. The green shirt has a satin feel and the yellow vest adds a tricky pop of color. Of course, no Joker costume could be complete without a necktie, which this ensemble conveniently includes. It also comes with a pair of wrist-length gloves to add the finishing touch. Once you have this Joker costume on, you may find yourself cooking up a nefarious scheme to get the jump on Batman once and for all. Just make sure you accessorize for the occasion, which means toting one of our toy guns with you.